The alliance against the BJP is a 'short-term' one being done for the benefits of the respective parties, Narendra Modi. 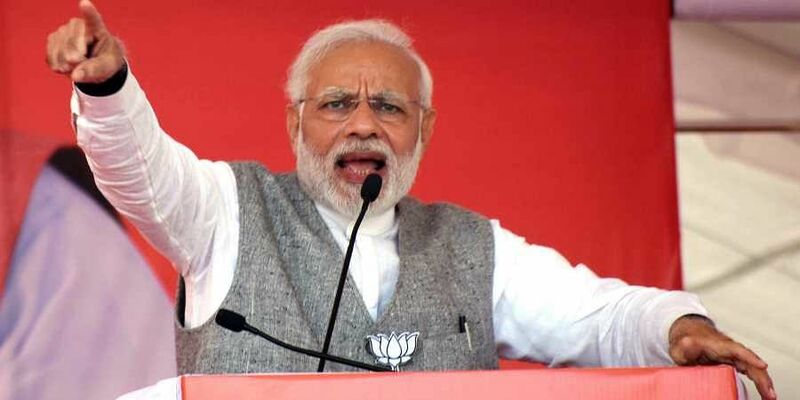 CHENNAI: Prime Minister Narendra Modi Sunday derided opposition efforts to cobble up a grand alliance against the BJP and pitched for his party's re-election in the coming parliamentary election, saying these "opportunistic" alliance and "dynastic" parties "want to build their own empire while we want to empower people". "On one hand we have our development agenda and on the other, there are opportunistic alliance and dynastic parties. This election is an opportunity for us to take the agenda of development to new heights. On one hand we have our development agenda and the vision of sabka saath sabka vikas. On the other hand, there are opportunistic alliance and dynasty parties," he said. A BJP worker is driven not by any self-interest but national interest, he said, adding only in the saffron party can a person born in socially backward and economically poor family think of reaching the top. "In the BJP one only needs hardwork, not big wallets, high birth or loyalty to one family. We are proud that a party with two MPs (to start off with) is ruling so many states and is running the government at the Centre," Modi said. "But they should not underestimate the people of India. Our friends in the opposition are anyway a confused lot. They leave no opportunity to say Modi is bad, government is not working, people dislike the BJP....the first thing that they do is make opportunist alliance with parties they disliked till recently and still do perhaps," he said, without naming anyone. "If Modi is so bad, government is not working and if the people dislike the BJP then why build these alliance. Should you not be confident about yourself. The truth is they know it is a working government, that the poor of India, the youth of India, the farmers of India and the women of India have a strong bond with the BJP." "Hence, for their own existence they are making short-term alliance," he said during the interaction with party workers from Mayiladuthurai, Sivaganga, Perambalur, Virudhunagar and Theni parliamentary constituencies as part of his 'Mera Booth, Sabse Mazboot' (My booth is the strongest) initiative. Taking a dig at the previous UPA government, he said it had built only 25 lakh houses in its last five years under a housing for poor scheme, whereas the present government has constructed 1.25 crore houses in four years. Asked about first time voters ahead of this year's polls, Modi asked his party workers to "make them your first priority" as they decide the future. "The BJP is a natural choice for first time voters," Modi added.